From the Hancock County Courthouse, go east on Hwy 22 for 7.7 miles to Springfield Church Road. Turn left and go 8.4 miles to a brushy area on the right that hides the foundation of an old homestead. 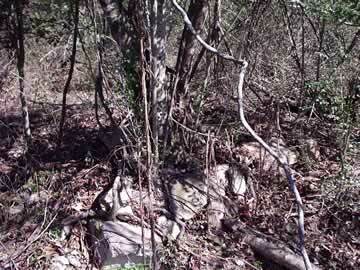 In this brushy area is a raised stone rectangular area which could be a grave. The grave is 260 feet east of Springfield Church Rd. Family tradition says that the Joel P. Dickinson cemetery was on the right side of Springfield Church Rd up toward the Greene County -- Hancock County line. The cemetery was at one time under a large oak and at the back of a field. This possible grave is under a very large oak, but there is no additional proof that this is, in fact, the Dickinson Cemetery. Further research is needed to confirm or refute that this is a cemetery, and, if it is, whether it is the Dickinson cemetery. This potential grave is technically located 260 feet into Taliaferro County, as Springfield Church Road is the border between Hancock and Taliaferro County along this 2-mile stretch. We include the cemetery here because, prior to 1830, this area was part of Hancock County and also because of the potential that this cemetery will become a "lost" cemetery. Family tradition says that he is buried in this part of the county. This raised rock, rectangular structure has a tree in it but is clearly man-made and of the right size.